Situated in leafy inner city residential area, Knightsbridge Apartments offer 3 levels of Studio-style accommodation. 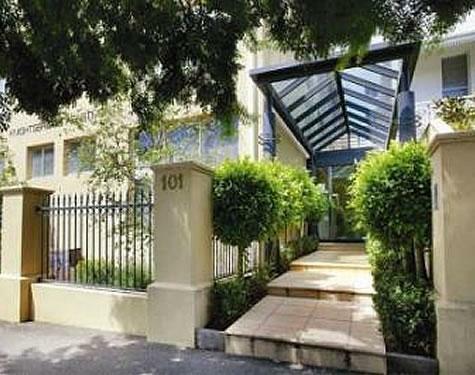 We are within walking distance of the MCG ground, Rod Laver Arena and the city centre of Melbourne. Take a short stroll to the tram line and take a ride along Flinders Street to the city. Alternatively the same line goes to Bridge Road, Richmond and its factory outlet shops. All apartments are equipped with kitchenette with microwave, bar fridge and all cutlery and crockery, ensuite bathroom with hairdryer, soaps and shampoo, remote air conditioning, 51cm remote TV, direct dial telephone, clock radio, iron and ironing board, security intercom apartment access. All standard studios have king size beds. Bedding can be either a king or 2 singles. Hotel services and facilities include fax and photocopying, same day dry cleaning (Mon to Fri) and free use laundry, room service (breakfast only) or do it yourself breakfast packs and daily maid service 6 days a week (except Sunday).